The proportion of youth and young adults residing in the United States who have dropped out of high school has declined from 1970 to 2016: from 15 to 6 percent, respectively. Although gaps between racial and ethnic groups have decreased over the last decade, Hispanic youth are still more likely to have dropped out of high school than children of other major races/ethnicities. The dropout rate for foreign-born youth shrank from 29 percent in 2000 to 10 percent in 2016, although it remains well above the national average. Black and Hispanic youth are more likely than non-Hispanic white or Asian youth to have dropped out of high school. In 2016, 5 percent of non-Hispanic white youth ages 16 to 24 were not enrolled in school and had not completed high school, compared with 6 percent of black youth and 9 percent of Hispanic youth. 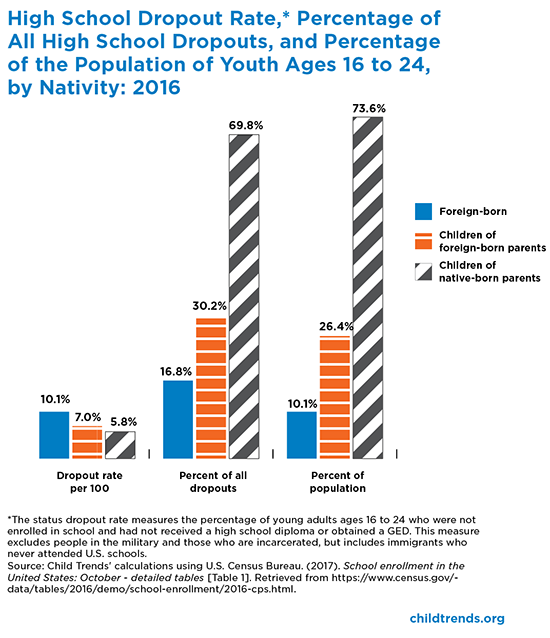 The high rate for Hispanic youth is partly the result of the high proportion of immigrants in this age group who never attended school in the United States. Asian youth had the lowest rate of all the racial and ethnic groups tabulated for this indicator, at 3 percent in 2016. Male youth and young adults are more like than their female counterparts to have dropped out of high school. In 2016, 7 percent of males ages 16 to 24 were high school dropouts, compared with 5 percent of females. Although males comprise roughly half of the population in this age group, they make up 59 percent of high school dropouts. In recent years, males have been more likely to drop out, but female youth were more likely to drop out of school prior to 1980 (Appendix 1). Foreign-born youth had a dropout rate of 10 percent in 2016. Additionally, the dropout rate was 7 percent for children of foreign-born parents and 6 percent for children of native-born parents. While foreign-born youth make up 10 percent of the total population in this age group, they make up 17 percent of the dropout population; similarly, children of foreign-born parents represent 26 percent of the total population in this age group, but make up 30 percent of high school dropouts. Since 2007, the dropout rate among foreign-born youth has declined much faster than for native-born youth. The rate among foreign-born youth declined from 27 to 10 percent during that period, while the rate among native-born youth declined from 7 to 6 percent (Appendix 1). State estimates from 2000 to 2016 (ages 16–19 only) are available at the KIDS COUNT Data Center. State estimates of public school students’ adjusted cohort graduation rates for the class of 2015–16 are available from the National Center for Education Statistics at https://nces.ed.gov/ccd/tables/ACGR_RE_and_characteristics_2015-16.asp. Child Trends’ calculations based on: U.S. Census Bureau. (2017). School enrollment in the United States: October – detailed tables [Table 1]. Retrieved from https://www.census.gov/topics/education/school-enrollment/data/tables.html. U.S. Department of Commerce, U.S. Census Bureau. (1970–2016). October Current Population Survey [Dataset]. Retrieved from http://www.census.gov/cps/.. This indicator uses the “status” high school dropout rate, which measures the percentage of young adults ages 16 through 24 in the civilian, non-institutionalized population who were not enrolled in a high school program and had not received a high school diploma or obtained an equivalency certificate. Note that this measure does not include youth in prison or in the military. While this indicator uses the status dropout rate, other indicators (such as on-time high school completion or high school graduation rates) are also used to measure educational attainment with regard to high school. For more information, see National Institute of Statistical Sciences/Education Statistics Services Institute Task Force on Graduation, Completion, and Dropout Indicators’ Final Report, available at http://nces.ed.gov/pubs2005/2005105.pdf. Note that this measure—sometimes referred to as the “status” dropout rate—represents only one of several ways for calculating the high school dropout rate. The “event” dropout rate reports the percentage of young people ages 15 through 24 who dropped out of grades 10 through 12 in the past year. The “cohort” dropout rate measures the percentage of an entering ninth-grade class that drops out before the end of the twelfth-grade year. The “status” dropout rate is the only measure for which there are reliable national data over a number of years. National data on cohort graduation rates show that 84.1 percent of the public high school class of 2015-16 graduated four years after entering ninth grade. See U.S. Department of Education, National Center for Education Statistics. (2017). Common Core of Data: America’s public schools [Table 1]. Washington, DC: Author. Retrieved from https://nces.ed.gov/ccd/tables/ACGR_RE_and_characteristics_2015-16.asp. Western, B. & Pettit, B. (2002). Beyond crime and punishment: Prisons and inequality. Contexts, 1(37), 37–43. Heckman, J. J. & LaFontaine, P. A. (2010). The American high school graduation rate: Trends and levels. Review of Economics and Statistics, 92(2), 244–262. Western, B. & Wildeman, C. (2009). The black family and mass incarceration. The Annals of the American Academy of Political and Social Science, 621, 221–242. Hispanics may be of any race. Totals of whites in this report do not include Hispanics. Fry, R. (2003). Hispanic youth dropping out of U.S. schools: Measuring the challenge. Washington, DC: Pew Hispanic Center. Retrieved from http://pewhispanic.org/reports/report.php?ReportID=19. Status dropout rate differs from event dropout rate, the latter being measured as the percentage of young people who dropped out of grades 10 through 12 in the past year. Chapman, C., Laird, J., Ifill, N., & KewalRamani, A. (2011). Trends in high school dropout and completion rates in the United States: 1972-2009 (NCES 2012-006). Washington, DC: U.S. Department of Education, National Center for Education Statistics. Retrieved from http://nces.ed.gov/pubs2012/2012006.pdf.